Military apparel has been an inspiration for fashion design ever since the Redcoats started looking so damn fancy marching in straight lines. While the military strategies of colonial armies have changed, luckily, their sense of fashion has not. With age-old naval outerwear as their muse, Roland Sands Designs has created a pair of functional peacoats for the lady rider. 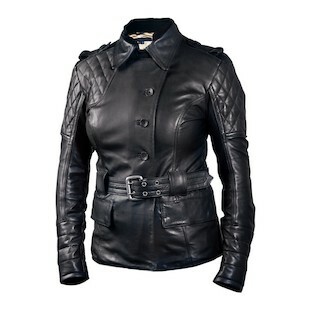 First up is the Roland Sands Oxford Jacket. While the design is certainly peacoat-inspired, there’s plenty of badass coursing through the veins of this jacket. Constructed with a hand finished, washed, and oiled top grain cowhide, the Oxford will certainly turn heads (as if your bitchin’ CB200 didn’t already). Flexible chest and shoulder panels along with pre-curved sleeves allow for a comfortable riding fit, while quilted accents add a touch of style. As with most other RSD jackets, there is minimal venting. Some perforated trim here and there along with venting on the sleeves will prevent heat stroke, but don’t expect to be have too much fun in the sun. The liner is made from a satin polyester material, as is the inside of the collar. Needless to say, it’s comfy. Pockets on the sleeve and chest will provide storage for the essentials, while a soft-lined electronics pocket will keep your smartphone safe and secure. For those of you who don’t enjoy breaking bones, the Oxford will accept RSD’s full compliment of shoulder, elbow, and back armor. If leathers aren’t your bag, dig the Vex. The Oxford’s little sister has a water resistant polyurethane-coated cotton chassis. Custom RSD buckles and buttons contrast with the tough cotton exterior. It maintains the same articulated fit as the Oxford, but with a more relaxed cafe-style collar. The Vex shares many of the same features with the Oxford, including the interior liner, leather trim, pocket layout, and the ability to accommodate RSD’s armor. Overall, the style is a bit more plain and utilitarian. If flash isn’t your thing, the Roland Sands Vex is certainly the better of the two. 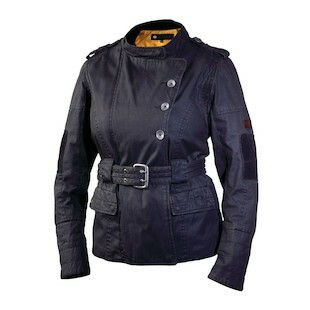 While moto peacoats won’t protect you on a race track, they’ll be more than enough to zip around town to and from work. Making style and function work well together is nearly impossible, but somehow Roland Sands has found a way with the Oxford and the Vex.